A protected bike lane on Ames Street, Cambridge, Mass. Take a deep breath, y’all. Here are three words you don’t get to say every day. Protected bike lanes are here, and they’re here to stay. They’re nowhere close to being as common as they need to be. Countless thousands of streets across the United States still need them — in many cases urgently. And of course, there are many, many things that cities (and biking) need in addition to one particular type of bike infrastructure. But after years of deliberate work on this specific issue, the American movement for better biking deserves to celebrate something big and real: We have successfully introduced a new idea into the American transportation system. There’s no need to repeat here the reasons protected bike lanes are good and important. They were an idea that briefly flowered in the U.S. around the start of the 20th century, then withered. Resurrected in Europe, protected bike lanes took off in the Netherlands and Denmark in the 1960s and 1970s, but U.S. efforts to follow that example fell apart. For 30 years, many American biking advocates spoke in the abstract of “Dutch” or “European” infrastructure, but it was hard to sell the country on a consciously foreign concept. Then Montréal started doing interesting things, and then New York City did. Portland, Washington and Chicago followed. And then, amid much more strategic work behind the scenes, the flood. The Federal Highway Administration endorsed them last year. So did Caltrans, the largest state department of transportation. The American Association of State Highway and Transportation Officials seems to be preparing to follow suit. Those institutions are all responding to facts on the ground. 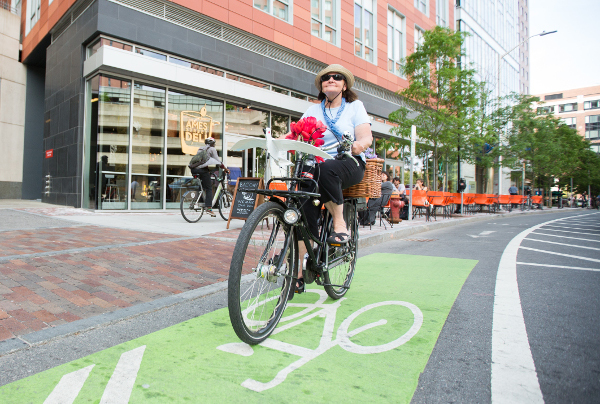 The number of protected bike lanes in the United States is literally growing exponentially. Starting in 2009, the total has doubled every 26 months. This is a historic victory. And as the work continues at the local level to build political support for particular protected bike lane projects, cities and advocates around the country are getting ready to participate in a first-of-its-kind event for May 9-13: Protected Bike Lane Week. It’ll recognize the country’s rapid progress over the last six years. SW Moody Avenue, Portland, Ore. If you’d like to participate, we’d love to help. PeopleForBikes is offering 10 mini-grants of $500 for cities and community groups that want to organize local events. Whether or not you want to apply, enter your information here so we can help call attention to your event and put it in the running for a mini-grant. Got questions? Email Green Lane Project Marketing Manager Aisling O’Suilleabhain: aisling@peopleforbikes.org. 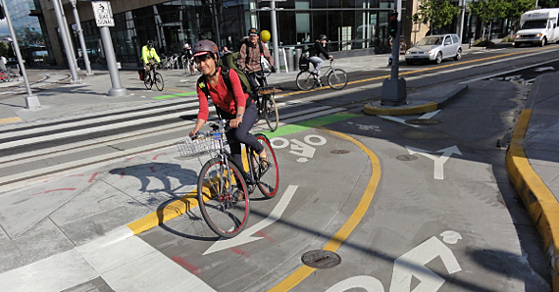 The story of protected bike lanes in the United States is just beginning. But without the work of city officials and community advocates around the country over the last six years, it would have never had a chance to begin.